The great thing about having a big ol’ stockpile of imported Kit-Kats is that when I have a really gross one, like the last one I wrote about and whose freakish attempt to blend starches and white chocolate, I can fall back on something super safe and bound to be delicious. 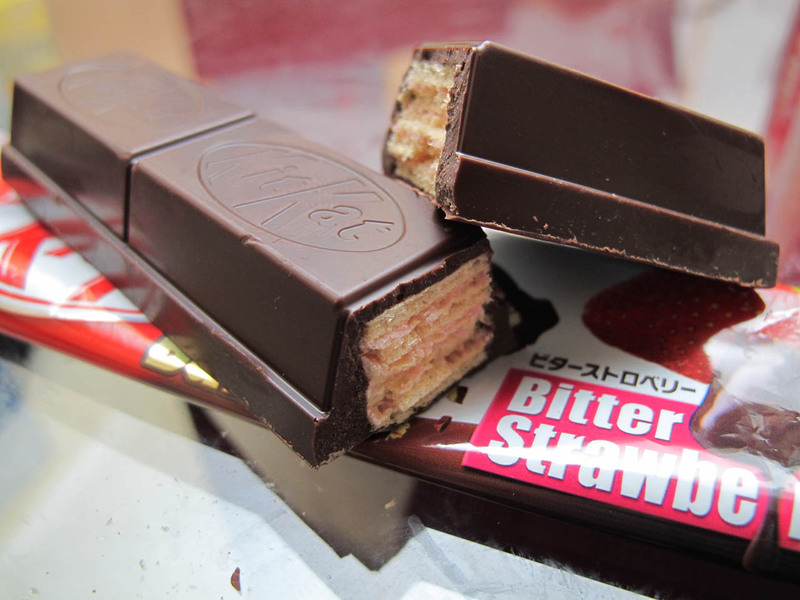 Introducing Japan’s Bitter Strawberry Kit-Kat bar. It’s good! It also means “dark chocolate,” which is nice, because this is one of those big ol’ bars with the super-thick chocolate on the outside. Usually the gods of Kit-Kat make horrible decisions with the giant bars, like, “Hey guys, let’s surround this bar in super-thick white chocolate that tastes like bananas or potatoes or something.” This time it was just nice, simple, dark chocolate that was slightly tainted by the hint of an imitation fruit flavor. I am OK with that. This bar, unlike other Big Kats or Chunky Monkey Kats or whatever they’re called, was segmented into three portions for easy breakin’ and sharin’ in the classic Kit-Kat style. Sadly, I was home alone when I ate this, so I was forced to be a selfish jerk and eat it all myself. I have no regrets. It was delicious. This flavor is not available in America because America is stupid. This entry was posted in BakeSpite, Kit-Kat Densetsu and tagged chocolate, kit kat. Bookmark the permalink. This reminded me I had one of these sitting on my kitchen table. Hello breakfast! They had dark chocolate Kit-Kats in the US a few years ago. I still wish I’d bought some. I don’t think the chunky ones come in alternate flavors anymore, but white and dark standard bars are still sold here unless something has changed radically of late.